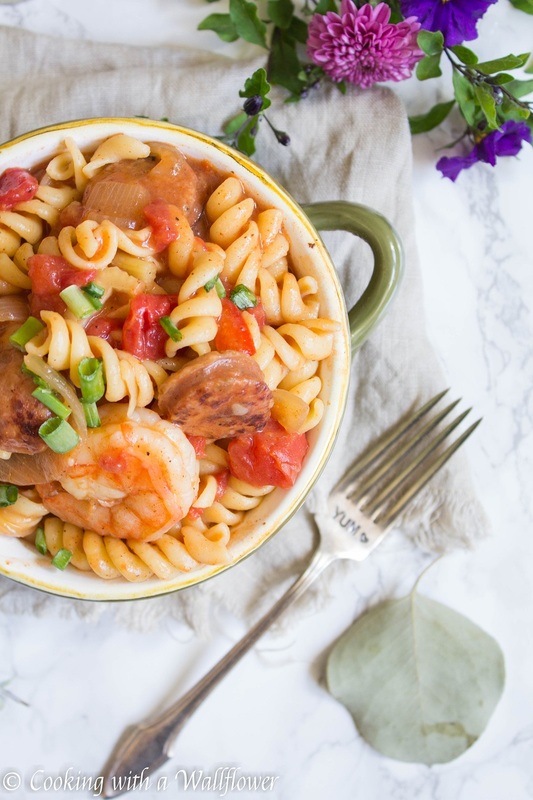 Rotini pasta tossed with sausage, shrimp, tomatoes, and onions in Cajun seasoning. 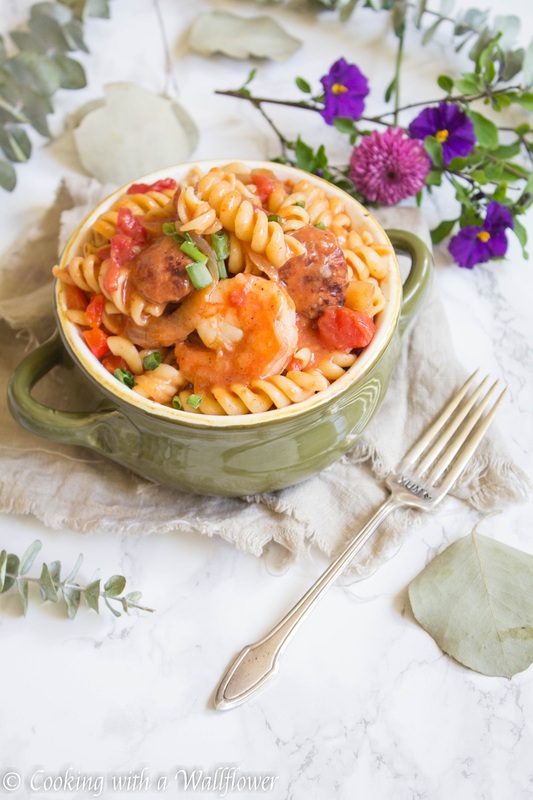 This pasta jambalaya is deliciously flavorful and perfect for a weeknight dinner. I think I’ve mentioned many times before that I have this possibly unhealthy obsession with pasta. 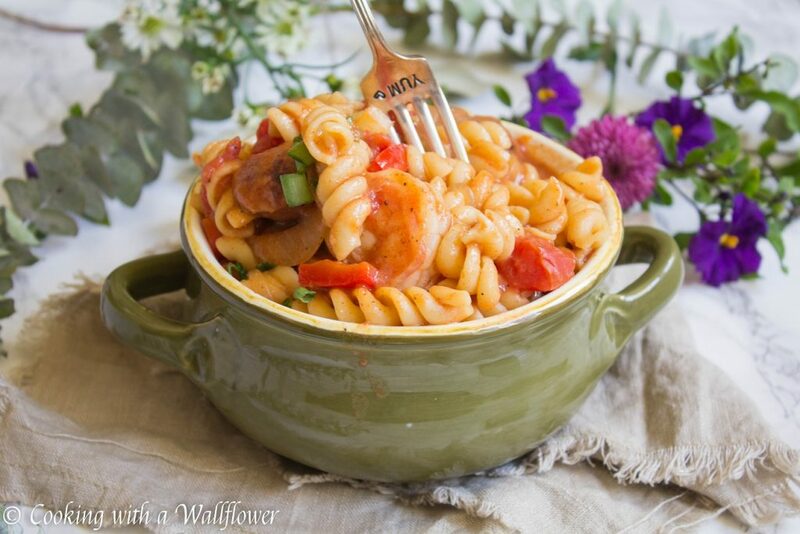 I’m pretty sure I could have pasta with any sauce, any ingredient, any time, and I would never be tired of it. 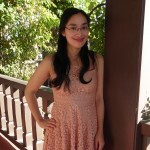 So since the unofficial end of summer started Labor Day weekend, I thought I could begin sharing easy cozy weeknight dinners with you. I’m all about that quick and simple kind of life. Especially when I come home from work exhausted. I’m always starving when I walk through the front door and I need dinner as soon as possible. My favorite solution is anything pasta. I actually love pasta with tomato sauce from the jar. But I always add a ton of vegetables and extra seasoning to make it customized to my taste. That means pasta with all of my favorite fixings. 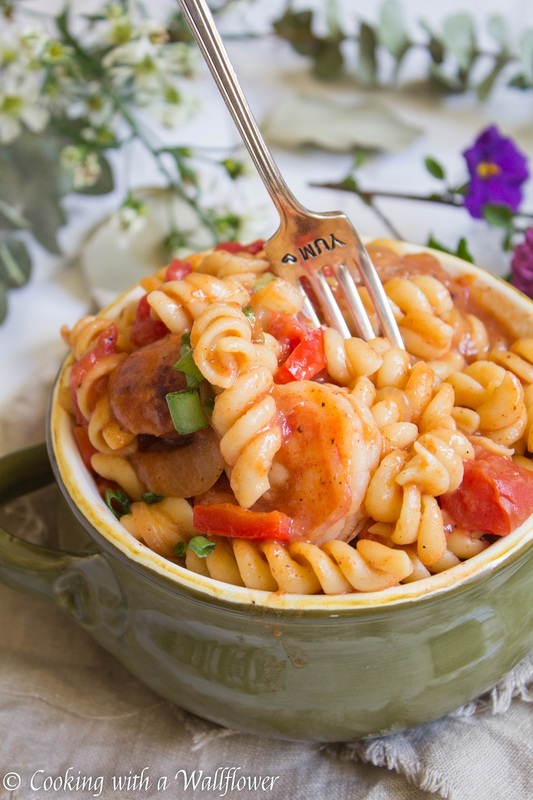 Today, we’re giving pasta a Cajun flair. I loooove Cajun food, but I don’t get to have it often. So… I decided to make this Pasta Jambalaya and share it with you <3. 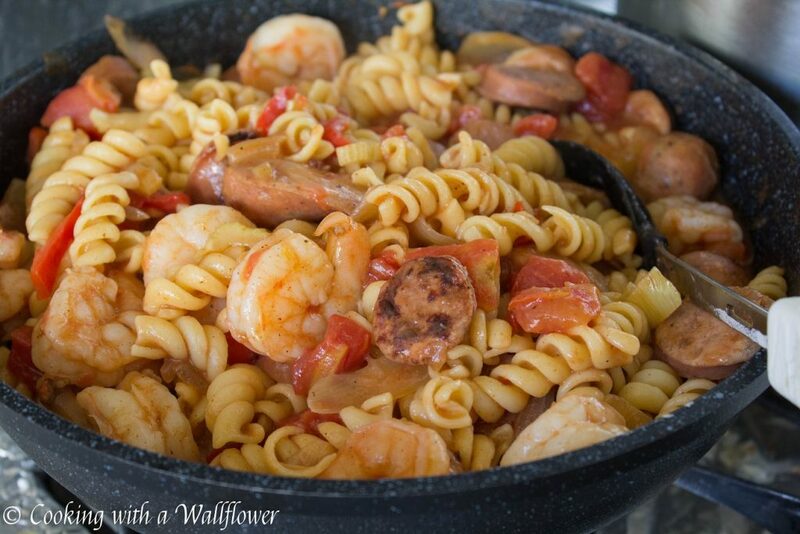 Pasta tossed with Cajun sausage, diced tomatoes, large shrimp, and sauteed onions. 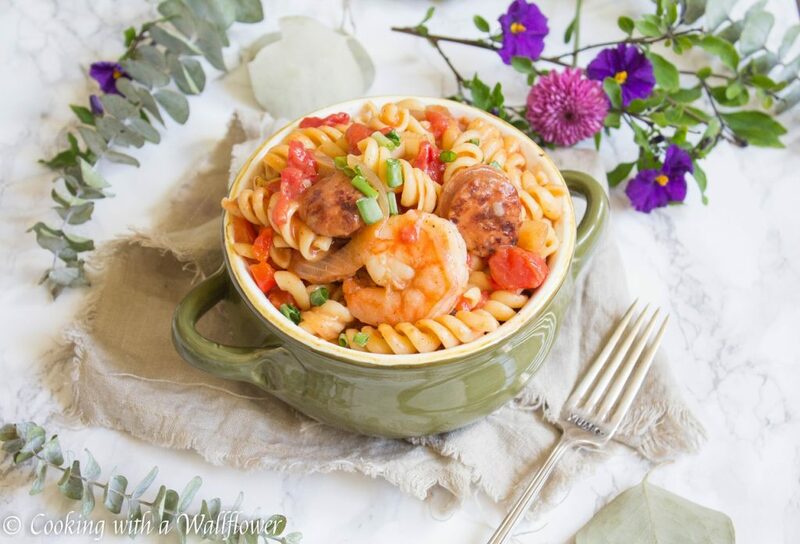 This dish is soo delicious and flavorful. You’ll want to make it for dinner and pack it for lunch the next day. In a large pot, heat water and cook the rotini pasta until al dente. Drain the pasta and run it through cold water to prevent it from continuing to cook. Set aside for now. In a large skillet, heat olive oil for about a minute. 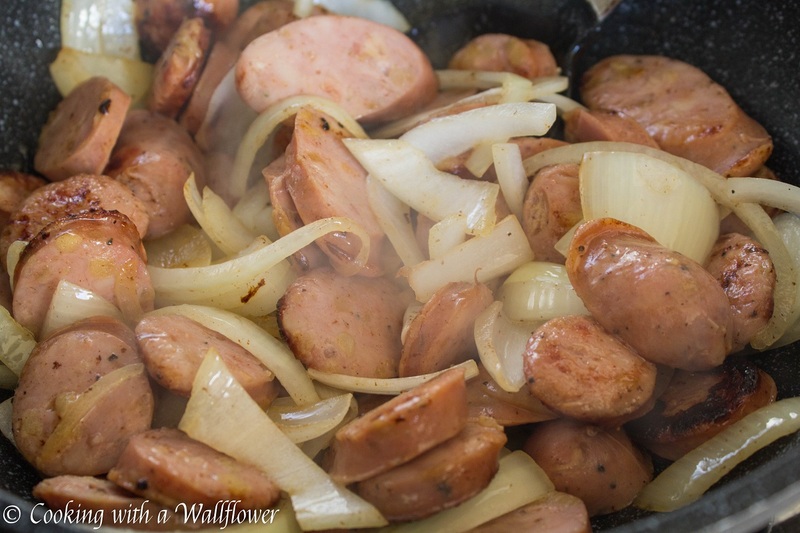 Once the olive oil is hot, add garlic, celery, onions, and sausage and cook until browned. You can pick your favorite sausage, but since I don’t eat beef, I usually get pork or chicken sausage. Add diced tomatoes, shrimp, chicken broth, and Cajun seasoning. 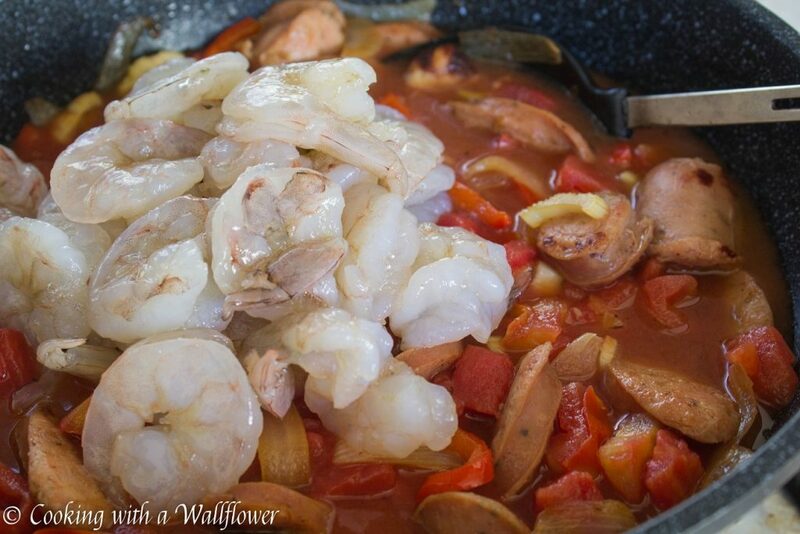 Cook until the shrimp turns from gray to reddish orange. Add the pasta to the skillet and toss until the pasta is completely covered in the sauce. 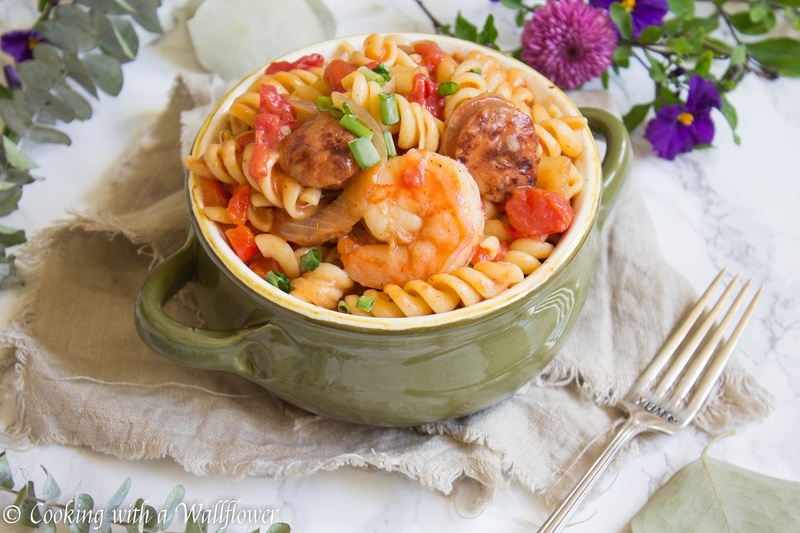 Serve the pasta jambalaya warm garnished with green onions. 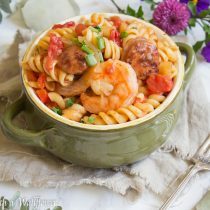 This entry was posted in Entree, Farmer's Market, Pasta, Quick and Easy, Recipes and tagged entree, jambalaya, Pasta, quick and easy, weeknight dinner. Looks good. May I ask what Cajun seasoning do you use? It’s always Tony Chachere. lol. Do you have a different recommendation? We use Tony too. There is another brand called “Slap Yer Mama” that has a little more heat.